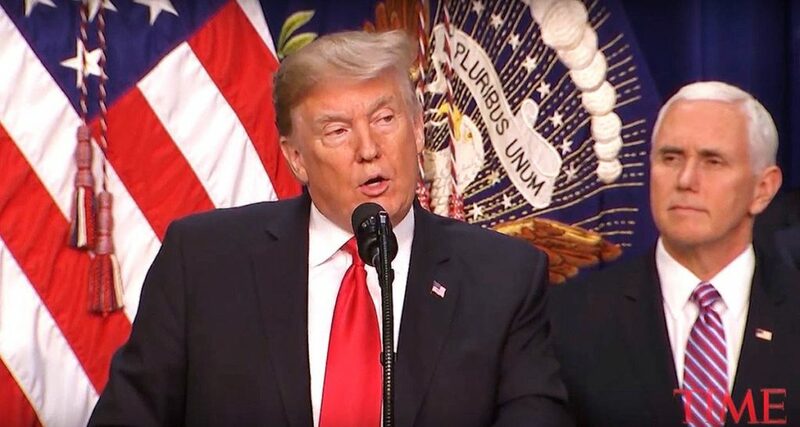 President Donald Trump said he was prepared for a long government shutdown during a bill signing ceremony Friday, as the U.S. Senate is expected to reject a bill that provides $5 billion for a wall along the U.S.-Mexico border. “It’s up to the Democrats. It’s really the Democrat shut down. We’ve done our thing,” he said. The bill was passed by the House of Representatives Thursday night and fully provides the requested $5 billion for the border wall. The passage of the bill is particularly noteworthy because Democratic House Minority Leader Nancy Pelosi told Trump in the Oval Office last week that he did not have the votes in the House for such a bill. Trump’s declaration comes after he urged Senate Majority Leader Mitch McConnell to use the nuclear option to end the filibuster in the upper chamber, securing the bill’s passage.